Tucson Nursing Home Theft Lawyer, Nursing Home Fraud Attorney | Russo, Russo & Slania, P.C. If you or your loved one is a victim of theft or fraud at a nursing home, the experienced attorneys of Russo, Russo & Slania, P.C. are prepared to fight for justice on your behalf. Elderly nursing home residents who are under the supervision of physicians and nursing home staff and administration typically hold their caretakers in high regard. When a resident of a nursing home or their family begins to suspect that a nursing home employee is stealing or committing fraud, it can come as a shock to the victim and their loved ones. An elderly victim of theft or fraud can go through many emotional stages upon realizing the actions that have been committed against them, ranging from denial to depression. By extension, family members or legal guardians who suspect that a resident is being taken advantage of can similarly experience feelings of disbelief and distrust. Russo, Russo & Slania, P.C. was established in 1956, and our team has made it our mission to protect the elderly. Over the past 60 years, our Tucson nursing home theft lawyers have represented hundreds of nursing home residents, many of whom have fallen to deceitful traps laid by nursing home staff. In our many years, we have achieved significant verdicts and settlements for our deserving clients. 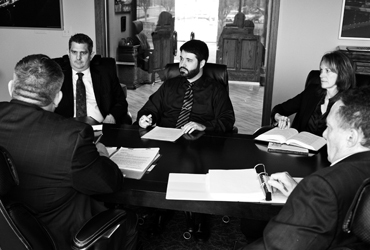 Our legal team is Lead Counsel rated and upholds an AVVO rating of 10. For more than six decades, Russo, Russo & Slania, P.C. has been considered a respected legal establishment by the Tucson community. Our mission to serve reaches beyond providing legal representation, we also dedicate our time to community service projects and humanitarian outreach missions in an effort to give back to the great state of Arizona. If you or someone you love has experienced theft or fraud while under the care of a nursing home, contact Russo, Russo & Slania, P.C. for a confidential and free consultation with one of our nursing home lawyers. Call us at (520) 529-1515 or fill out our email form to get in contact with one of our skilled attorneys. Why Do I Need a Nursing Home Lawyer? After you have confirmed your suspicions that you or your loved one is being taken advantage of by a thief, you may be reeling with questions. We have seen countless nursing home residents who have exhibited the same feelings of remorse and shock. You may be wondering: how could I have missed the obvious signs? What am I going to do in the future? Will I be able to get my money back? The attorneys at Russo, Russo & Slania, P.C. are experienced in handling issues of theft and fraud in nursing homes. As the victim of such illegal actions, you may be legally entitled to recover some of the money that was wrongfully taken from you. However, it is unlikely that you’ll receive the full amount of monetary compensation you deserve without a nursing home lawyer on your side. We are familiar with the unjust tactics and coercion used by nursing home staff to avoid punishment, and our attorneys are prepared to see that the guilty party is held accountable for their actions. The legal process can be overwhelming and difficult to navigate. Let Russo, Russo & Slania, P.C. carry out the arduous legal legwork so that you can begin to heal and move forward with your life. Nursing home fraud and theft can take many forms. Some people are completely oblivious to the fact that their money is being stolen or that they have fallen victim to deliberate deception. On the other hand, some nursing home residents may be suspicious of such actions or coerced into following the orders of their victimizers. Some red flags that your loved one is being financially abused may be the discovery of unusual ATM purchases, a decline in their credit score, the unexplained absence of valuable possessions in the home, or unfamiliar signed documents and receipts. If you feel that your loved one is being exploited by a staff member, your relative may feel defensive if you bring it to their attention. Many elderly residents become lonely in their old age, and scammers take advantage of their desire for attention and comradery. Your loved one may feel unusually close to the person who is stealing from them and demonstrate reluctance when you attempt to offer help. When nursing home residents are exploited, and their finances are abused, the consequences can be dire. Elderly people may lose so much money that they are unable to pay for their residency fees, medical bills, or have money left over for their families once they pass. If you feel your loved one is being exploited, it is of the utmost importance that you take action immediately. The Tucson nursing home abuse lawyers of Russo, Russo & Slania, P.C. are prepared to fight for the elderly of Tucson, Arizona. We are deeply sympathetic towards those who are financially exploited, especially when the victim has decreased cognitive abilities, poor self-esteem, or is in a lowered state of health. That is why our compassionate legal team has put forth their efforts to help make sure that those living in nursing homes are treated well and receive justice when they’ve been abused. If you or your loved one has experienced fraud or theft in an Arizona nursing home, contact the attorneys of Russo, Russo & Slania, P.C. right away. Call us at (520) 529-1515 or fill out our email form to schedule your free consultation right away.